In order for clickable maps to work you must first have Firefox installed. The link for this is here. After you have installed Firefox you will need to install greasemonkey. The link for this is here. Now that you have all this you are ready to install a variety of different scripts to enhance your conquer club experience. However this is only dedicated to installing Clickable Maps. In order to install clickable maps, click on this link and then click install. You now have clickable maps. Now hover over the Appearance tab and when there change it to these settings. This will make them a little more complicated to use at first but it as good long term benefits. 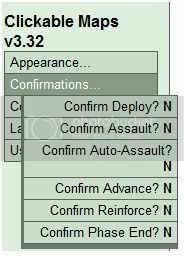 Next you need to hover over the conformations tab and change them all to N (no) this will allow you to be faster in making moves. At first you may make a few mistakes but give it a few games and you will be much better off without the conformations. After you have completed this there is one more thing you need to change (In my opinion) I don’t use the mouse scroll to change troop amounts as it is not useful in my eyes and causes enough mistakes that it is not worth it those few times you need to use the feature. Now you have successfully installed and set up clickable maps. There are a few things you still need to know however to get the most out of clickable maps. These are the hotkeys that come with clickable maps. This is everything I could think of, there may be stuff I left out or a place where I skipped a step. Please feel free to PM/Wall ljex with any questions you may have or something you wish I had included in this tutorial. It is also suggested that you read the User Guide(located here) as this will explain everything in more detail and may explain things I left out. No big secret just thins a lot of newer players dont know that you can become faster with clickies if you change the settings. The reason i need to email it was because i cant post pictures on cc as photobucket doesn't work for me and it doesn't really make sense without the pictures. Excelllent.Thats exactly how I set mine,ljex. I also close all the background programs and never ever install BOB.I did that once and it killed what little speed I have. when I click on the link it just pulls up the script what do I do? swennis wrote: when I click on the link it just pulls up the script what do I do? Do you have greasemonkey installed? any mac users out there who know? I assume they do. Test it out on a casual game if you like. Interesting, I will have to try this. I would suggest new people to clickies may want the crosshairs in practicing to get quick before elmininating, and to practice on every game that doesnt matter first. I don't think this works on old version of moz firefox or have i missed something? I must admit, I was a bit skeptical about installing something for an online game that required no downloads officially, but this tool has already proven to be quite useful and I've only used it for one game! It may have even ended up to be a loss without it. Thanks for all the hard work that you put into developing this. Monsterblood wrote: I don't think this works on old version of moz firefox or have i missed something? Is there a chance of this coming on on Internet explorer or opera? Very small chance I guess. KingUncles wrote: Is there a chance of this coming on on Internet explorer or opera? Hmm, I'll check whether it works on Opera. IE: not likely, or maybe IE9 if it gets a similar functionality. Ok, both CM and BOB had an issue with Opera, but they were easy fixes so I just updated the scripts. You can just use the standard scripts from userscripts. Didn't check everything btw, but the basics work. A couple of issues you all may be able to solve. When I click to change my settings. The drop down pops up and then when I try to move my mouse to the drop down the settings go away. Hence, it won't let me change my settings. Wondering if anyone else is having this problem? I have had clickies for a long time and have changed my settings before, but now it won't let me! Also, I did not know about the alt trick. Do I just hold down alt while making the attack and it auto advances? Chuuuuck wrote: A couple of issues you all may be able to solve. Hmm, that's the incompability I changed to get it to work with opera.. Did you install in the last 45 minutes (don't have the issue btw)? 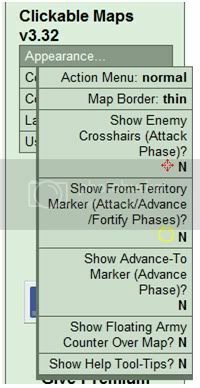 And the alt-trick only works in combination with a click on the map indicating an auto-assault, so either a right-click or left-click with shift pressed. Yeah just hold alt for auto advances but know that if your last attack fails the next attack you make will automatically auto advance, unless they fixed that bug. You need to hold it during the attack action. This happens to me, too, when I try to install on my home computer. Even though I am using the most updated firefox, greasemonkey and wearing a tu-tu. What gives? Can anyone help troubleshoot this problem? No pop-up window opens when I click "Install". Is it possible your security software is blocking the site hosting the scripts, or at least preventing it from running active elements?